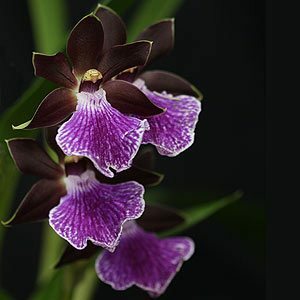 Zygopetalum orchids are becoming increasingly popular, they do have a tropical look to them and are fairly easy to grow. These are an orchid that prefer a relatively cool environment and a good filtered light that mimics the natural growing conditions. In the natural environment they grow in the dappled shade of forested areas early morning sun and late afternoon sun is OK. They do require a position where they will be protected from direct sun especially during the warmer parts of the day. They do like a little humidity and Zygopetalum orchids do not like to dry out completely, so watering is important. 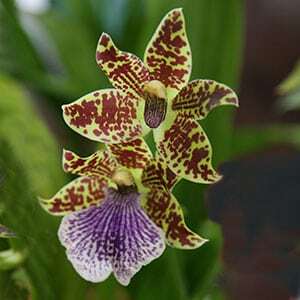 You will also find intergeneric hybrids such as Zygoneria, and these are hybrids between Zygopetalum and Neogardneria. These are a glossy leafed orchid with fragrant flowers that require mild night time temperatures, originally from the higher altitudes of South America and can tolerate high temperatures as long as they are protected from direct harsh sunlight. Easy to grow in cooler climates, these are an orchid that does not go dormant and requires moisture year round. At the same time good drainage is essential. Most growers use a medium pine bark as the main potting mixture, this provides the drainage. You can easily buy specialist potting mixes for cymbidium orchids which is excellent for Zygos, and for most growers we recommend this. A potting mix of pine bark and perlite seems to work well. Although Zygos grow well in cool climates they do not like cold wet winters. Hold back on the water during winter and bring the pots into a sheltered position. A 50% shade cloth will generally provide the right amount of light, so although good filtered light is required avoid strong direct sunlight. A specialist orchid fertilizer applied at a diluted rate (50%) every week during the growing season will provide excellent results. Z. mackayi is a fragrant species from Brazil, beautiful flowers and easy to grow if water can be maintained. Z. intermedium is a very fragrant species. Z. crinitum is another popular species.